Snuggles Snoozing 'n' Carrying Bag. Super soft plush and quilted poly -cotton carry and sleeping bag. with detachable shoulder strap. Machine washable at 30c. 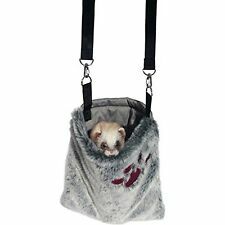 Pod carrier designed for smaller pets. Ideal for safe and secure pet travel or as a temporary home during cage cleaning. Please note: this product comes in assorted colours, you will receive either Purple, Red or Blue. Features: as a temporary home during cage cleaning. Ventillation slits for good air circulation. Specification: The Medium is 23 x 17 x 15cm and is ideal for hamsters, mice and gerbils. This plastic carrier is designed for the safe and secure transportation of your guinea pigs, rats and degus. Carry handle. Suitable for small sized guinea pigs, rats and degus. We go above and beyond to ensure you receive the best level of service.